A stunning trail of sound and light will pass through Derry’s city centre next weekend as part of the city’s Christmas festivities. On Friday and Saturday, November 24 and 25, The ‘Sound of Light’ will illuminate some of the most recognisable landmarks and add a touch of magic to old buildings and streets. Speaking ahead of the event, Mayor Hilary McClintock said: “Following on from the 2015 spectacular event, this will be the highlight of this year’s Christmas celebrations. The Sound of Light Trail in Derry will begin with a magical procession which will make its way through the city centre from 7pm on Friday November 25, and from 6pm on Saturday November 26. It will feature colourful Christmas characters brought to life by production company LUXE. 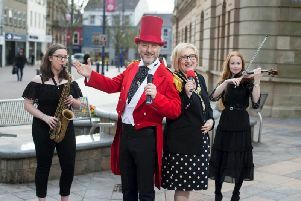 The procession will weave through the streets, leaving from Bishop Street car park, making its way through the Cathedral Quarter, then via Pump Street and Ferryquay Street and down through the city centre until it reaches the Guildhall Square, before finally stopping at Victoria Market. For further details on Derry City and Strabane District Council’s Christmas Programme events visit www.derrystrabane.com/christmas.